Olivia Henry holds a microphone for Amador resident Ashley Moore, a key source in Capital Public Radio's reporting. Climbing the western slope of the central Sierra Nevada mountains, California’s Amador County is known for its wild beauty, Gold Rush history and small-town quality of life. It’s also home to a darker landscape — one of the highest suicide rates in the state. Last year, Capital Public Radio’s Sammy Caiola was awarded a USC Annenberg Center for Health Journalism California Fellowship to explore why that rate is so high — the third-highest in California — and how journalism could play a role in suicide prevention. Sammy invited us to design an engagement process to serve those goals. Here is a case study of what we did. This nuts-and-bolts account demonstrates the newsroom and community effort that goes into wraparound engaged journalism, as well as the impact it can generate. Reread and revise it often. Introduce yourself and involve trusted sources of information. Ask local experts to frame the issues and solutions. jesikah is CapRadio’s Senior Community Engagement Strategist. She has spent the past three years leading engagement efforts on housing, education and hunger in the station’s documentary unit. Olivia is the engagement editor at the USC Annenberg Center for Health Journalism, where she mentors California reporters in engagement techniques such as crowdsourcing, community consultation and collaborative storytelling. This project was launched through Sammy’s USC Annenberg Center for Health Journalism California Fellowship. As part of the support that the Center provides, Sammy participated in a training program at USC, received reporting and engagement grants, and got six months of mentoring in engagement and reporting. Step 1: Write up a plan. Reread and revise it often. Our first step was to generate a shared vision for our work. Together with Sammy, we listed reporting goals, who was most affected, what organizations were working on suicide prevention, who had the power to make change, and possible outcomes of her reporting. We referenced and tweaked these lists often as we learned from the community over the following months. Step 2: Introduce yourself — and involve trusted sources of information. Sammy met people at the run who became key voices in her story: the CEO of Sutter Amador Hospital, the mother of someone who recently completed suicide, and a woman who had recently sought help for mental illness. 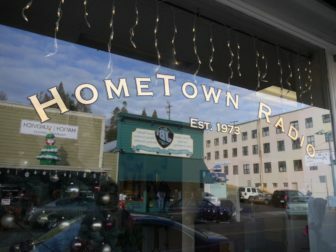 Broadcasting from downtown Jackson, Calif., KVGC Hometown Radio is one of Amador’s local news sources. We also published an online callout using a powerful survey tool called Screendoor to meet people who cared about prevention, wanted to offer resources or had personal stories. We submitted an op-ed to the local paper, the Amador Ledger Dispatch, to introduce Sammy and share the callout link. We also booked an interview for Sammy on local commercial radio station KVGC 1340 AM to further acquaint residents with Sammy and the reporting project. Working with local media would become an indispensable part of this project. Amador County, while inside CapRadio’s broadcast footprint, is not the subject of regular coverage. Residents told us that the station didn’t have much traction in the area, which was a barrier to trust. With that in mind, we appeared multiple times in the Ledger or on KVGC — sometimes with a task or a request, but other times just to check in. We were and remain very grateful for their help. Step 3: Ask local experts to frame issues and solutions. Capital Public Radio reporter Sammy Caiola takes notes at a June 2018 stakeholder convening in Sutter Creek, Calif. Using jesikah’s principles for designing powerful conversations, we brought Sammy’s growing list of contacts together to get guidance on reporting topics and learn how residents could use this journalism to advance community health. We convened about 50 people at the Sutter Creek Community Building. Participants included county employees, clinicians, veterans’ advocates, tribal members and folks with personal stories of suicide. Four of the people who responded to our newspaper callout also attended. Why is this happening in Amador County? What resources exist? What are the barriers? What’s needed? How can you use these stories in your work? How and where might you share them? What plans do you have for Suicide Prevention Week? What might we do together? We transcribed each table’s notes, then Sammy compiled them in this article about what she learned. A week later, we were delighted to see that a participant also wrote an op-ed about the convening in the Ledger Dispatch. Step 4: Act on community feedback. Amador County resident Heather Saxton drives 45 minutes to see a psychiatrist in a different county. At the convening, people told us they wanted CapRadio to share stories of Amador residents who faced mental-health challenges and sought help. In response, jesikah and Sammy published this online Conversation Kit, a discussion aid with pictures, audio clips and questions related to suicide prevention. Step 5: Stay in touch. Another part of keeping momentum alive — and being accountable to the people involved with the project — was sending regular emails to our ballooning contacts list. To reach folks not on that list, we booked Sammy for another update interview on KVGC. We also published another op-ed in the Ledger Dispatch to let residents know where Sammy was in her reporting process. Step 6: Find opportunities for synergy. Convening participants told us they wanted CapRadio to participate in September’s Suicide Prevention Week in some way. We were game but needed a partner to help map our ideas to local needs and efforts. 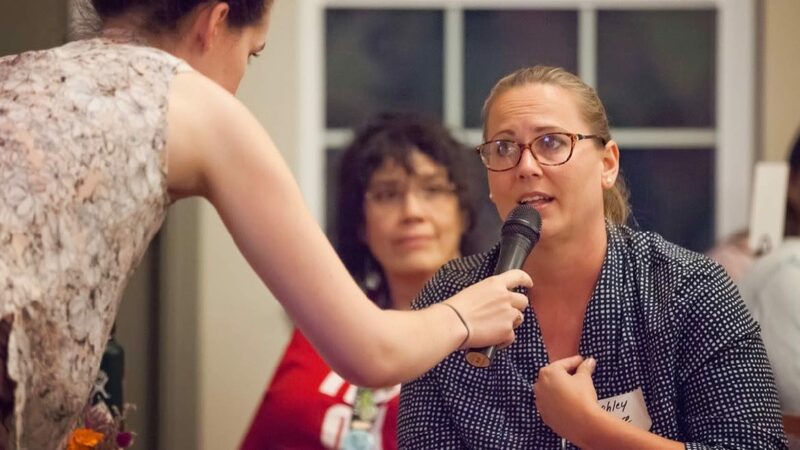 Stephanie Hess, who coordinates the county’s Mental Health Services Act working group, and her colleague Vanessa Compton were eager to collaborate. We quickly landed on three shared goals: bringing the community together to explore a taboo topic, naming challenges and lifting up suicide prevention resources. We agreed that a community conversation and resource fair would be the right format to achieve those aims. We sketched out an agenda, found a venue and set a date. Two weeks before the community conversation event, there was a murder-suicide in Amador — the second in five months. We weren’t sure if this was the right time to host a conversation about suicide, but our partners assured us that it was. To be safe, we arranged to have two social workers on hand to support people as needed. Sammy’s four features aired daily during National Suicide Prevention week, first on CapRadio, then on KVGC. The series was prefaced by this note from project editor and Amador resident Linnea Edmeier. She made a case for why, even at a difficult time, this reporting was important. Not everyone felt the same way, though. The Ledger Dispatch shared Sammy’s articles on Facebook, and some commenters accused CapRadio of exploiting a tragedy. 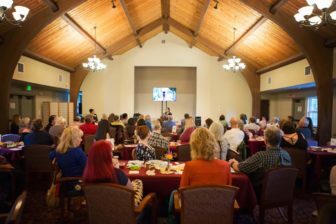 More than 100 people attended a community conversation about suicide prevention co-hosted by Capital Public Radio. We saw a huge spike in RSVPs in the days preceding the event. More than 100 people packed into a space originally billed for about 70. That was in large part due to our community partner’s ability to promote the event in local networks. We saw lots of familiar faces, too: Among the attendees were people who responded to our original callout and came to the first convening. The event agenda was simple: Over a shared meal, Sammy explained her reporting process, her data and what she discovered as a “city kid” reporting on rural issues. Then attendees listened to clips and discussed them in small groups. People shared reactions, asked questions and traded resources. We saw connections sparking around the room: School-district staff learned about programs that could come to classrooms, a nurse grabbed stacks of literature for her patients, and people signed up for safeTalk trainings on the dessert table. 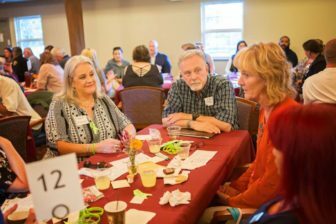 Event participants discussed challenges and opportunities around suicide prevention in Amador. After the event, we circled back with everyone who participated and responded to a few new requests. We sent thank-you emails, published an event summary to the project website and wrote an explainer of the project’s data after hearing questions about it at the event. Responding to an invitation from school staff, Sammy presented at a local high school about her project. jesikah visited the MHSA working group to demonstrate the Conversation Kit in more depth and was thrilled to hear members immediately brainstorm ways of using it in their suicide prevention work. Step 7: Evaluate what happened. 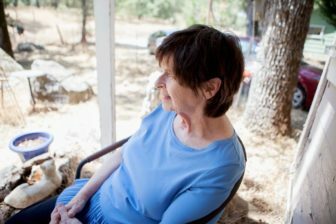 86 percent of participants reported being more aware of the high suicide rate in Amador County and what causes people in rural areas to take their own lives. 83 percent of respondents said they would be more comfortable talking about suicide and suicide risk factors with friends and/or family. 88 percent of respondents said they were motivated to address challenges facing Amador County and its ability to lower the suicide rate. For us, the indispensable ingredient in this project was our capable and motivated partners. 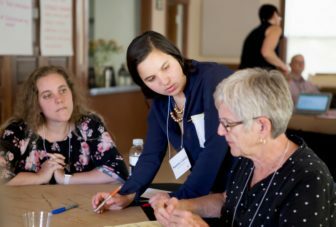 Local media, callout respondents, event participants and community collaborators stepped forward with CapRadio and the USC Annenberg Center for Health Journalism to advance suicide prevention in Amador County. Those relationships were not accidents or good luck. They were built on returned emails, answered questions, picked-up phone calls, proffered meals, swept floors and emptied trash. It was that unglamorous and often invisible labor that made it possible to build community around this reporting. We celebrate that work and thank our partners for sharing it with us.